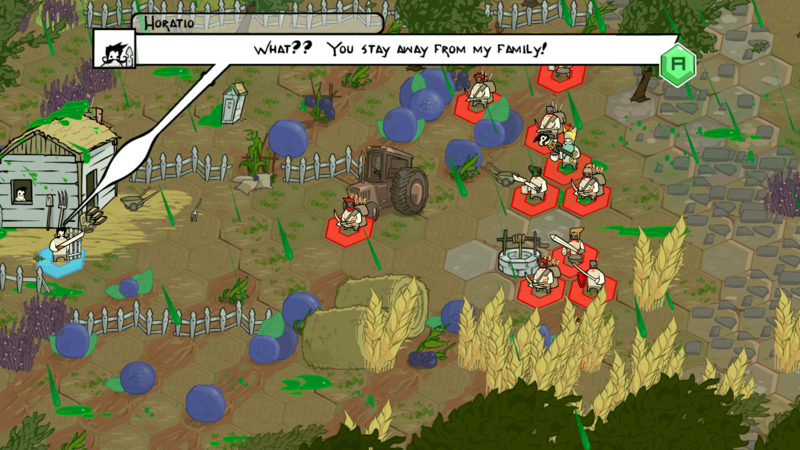 Local co-op play might be this strategy game's killer feature. In our world of ubiquitous broadband and online multiplayer, couch-based co-op gaming isn't the first consideration for most development studios. For the folks behind Alien Hominid, Castle Crashers, Battleblock Theater and now Pit People, however, being able to play with other people on the same screen has always been a priority. "Co-op memories are very strong with the right games and there's all sorts of fun interactions going on, not only in the game but for the players on the couch," said Dan Paladin, co-founder, art director and designer on Pit People. "Whenever it makes enough sense, we'll do our best to make sure it is always included! Our brains are firmly rooted in the old school stand-up-arcade era." 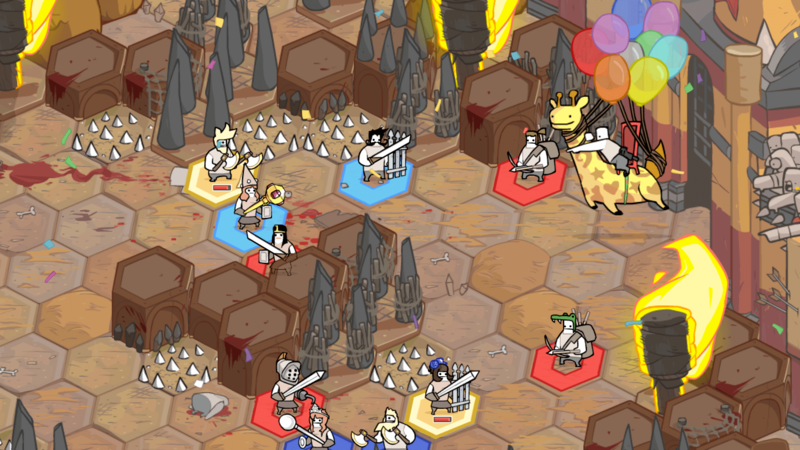 Pit People is a turn-based strategy game, with a cadre of odd fighters. You can level up in teams of five to explore the map, complete story quests and fight other people online as well as locally. Launched earlier this month, it's available on Xbox One and PC via Steam. Paladin realizes that co-op games are scarce but refuses to kowtow to the gaming fad. "There always seem to be some good co-op games to choose from, though it never seems like co-op games are in excess," he said. "A lot of us wish there'd be a little more of that going on. Other genres are emerging, very successful genres, that happen to be adversarial in part or in full. Some of those are dictating where a lot of the interest is but we've never made choices based on that kind of thing and don't plan to." Local multiplayer is the killer feature here, though. Not only can the second player shoot enemies on the large world map to stun and keep them from attacking, but you can enter battles together, giving you two teams of wacky heroes to take on the baddies. Gameplay is the same as in single player; there's just two of you this time. Each player moves her own characters around the map and hits the "Ready" button; once that happens the heroes do their assigned tasks. It's not split-screen, either -- everything happens on the same map. It's a delightful way to play -- you can either take on different clumps of bad guys at once or strategize and play together, taking out smaller groups of enemies in a combined show of force. It's not all co-op, either; you can jump into the Pit and fight against your buddy on the sofa, as well, if you're in the mood for a little rage-fueled couch session. The turn-based strategy of gameplay will remind you of games like XCOM, The Banner Saga and Mario + Rabbids; you need to know your character's abilities and attack style, placing them appropriately near and around the enemy troops. There's a big story single-player campaign, too, involving a giant demon bear that's crashed into the planet, raining acidic blood on the unsuspecting people below. The bear, who also narrates the adventure with droll sarcasm, plays the villain to your main character, Horatio, whose son is killed in an early cutscene. Never fear, however; the violence is played for laughs. The Behemoth has never taken itself too seriously. "We joke about things which end up going right into the game, like the pooping animals, thanking Justin Bieber in the credits, singing about buckling our pants or having a man ride a balloon-tied giraffe with uzis in his hands," said Paladin. "Those things are simply side conversations that we insist on immortalizing. Games are for you -- for fun! The development team having fun making the game is important, because it shines right through." While all of The Behemoth's games have a similar visual style to them, the mechanics are typically very different. "So far we've always made a [game in a] new genre which makes sure we're never all that comfortable or familiar," said Paladin. "We generally don't want it to be comfortable, though, as we want to solve strange problems and make new worlds for everyone to explore." The team has refined its approach over the last two decades, too. "Over time I've noticed we can get a little more bold and daring with our desire to reimagine an existing genre and put our own twists in there. We honestly have no idea what we're doing, though we hold onto the shreds of what worked before." Each game has taught the team something different. "After seeing people come up with a trading [feature] within our systems in Castle Crashers, we made sure we included trading in BattleBlock Theater," said Paladin. "When we noticed that people fought over whether they should be trading or progressing in the levels, we altered that system to be more of a vote-type system while including a 'Trade Only' mode in Pit People going forward. There's a lot of things like this but we don't tend to go into the details. We're secretive and stuff!" Pit People was a little different in scope when it was first imagined. "The original hope was to have a smaller design, but sometimes you just have to follow the design where players want it to lead," said Paladin. "We followed it until it had a big world with lots of things to explore and do, along with a main storyline that explains the world a lot more. It's definitely evolved, especially after getting lots of feedback and data from trade shows and Early Access/Game Preview versions." Now launched, what were the chances of Castle Crashers coming to Switch or mobile? With games with local multiplayer like Mario Kart and Snipperclips on the Switch, a local co-op game could thrive on Nintendo's platform. Paladin was understandably vague. "We would love to have our stuff on other platforms and hope to be able to tell you 'yes' for some of those one day," he told us. 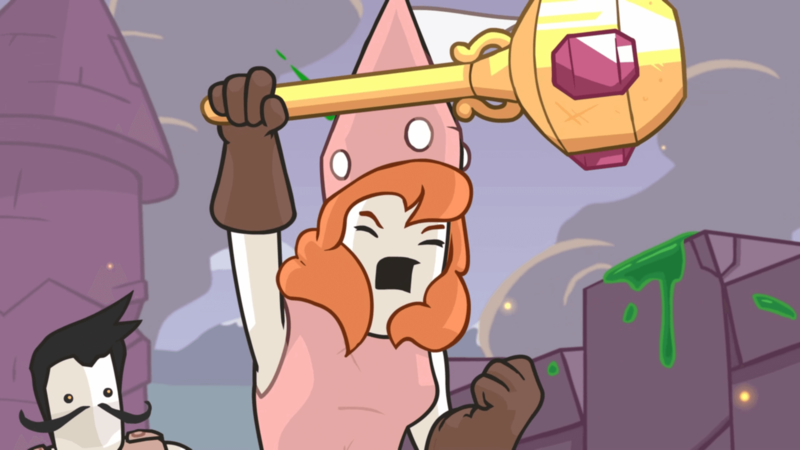 Ultimately, Pit People brings local co-op playback to your living room. The genre is new to The Behemoth, too, making its take on the strategy game something worth checking out. I had a great time playing through the campaign itself, thanks to the combination of superfunny cutscenes, wacky character design and deep strategic gameplay. Playing with my kids together on the same screen is a blast, both when trying to take on large groups of bad guys as well as fighting each other in the Pit. It's a refreshing way to play a turn-based strategy game: with (or against) real people sitting right next to you.